For older issues, contact adjutant@legionpost146.org. Monthly Meetings: Legion meetings are held at 0900 on the third Saturday of each month at the Elks Lodge, 444 Country Club Lane, Oceanside, CA 92054. See map. For members who want to attend the Post 146 meetings, but need transportation assistance, please contact the Adjutant at adjutant@legionpost146.org or 760-754-9633. Every dollar we save by recycling goes to the general fund. We collect donations of empty printer and toner cartridges, old cell phones, Copper, Brass, Aluminum, Steel, plastic bottles, glass bottles, and any plastic container that has a 2, 3, or 5 triangle code. Plastic bottles need to have the lids removed. In addition, please separate the CA CRV from the non-CRV containers as these items are recycled differently. Bring them to the monthly meeting or contact the Adjutant at adjutant@legionpost146.org or 760-754-9633. for other arrangements. We are seeking the donation of a 4' X 12', 5' X 12', or 6' X 12' enclosed trailer for storing the Post 146 supplies for Oceanside Harbor Days. If you have one or know someone who has one to donate, then please contact the Adjutant at adjutant@legionpost146.org or 760-754-9633. Membership dues for 2019 may be paid on-line, at the next post meeting, or by mail to American Legion Post 146, P.O. 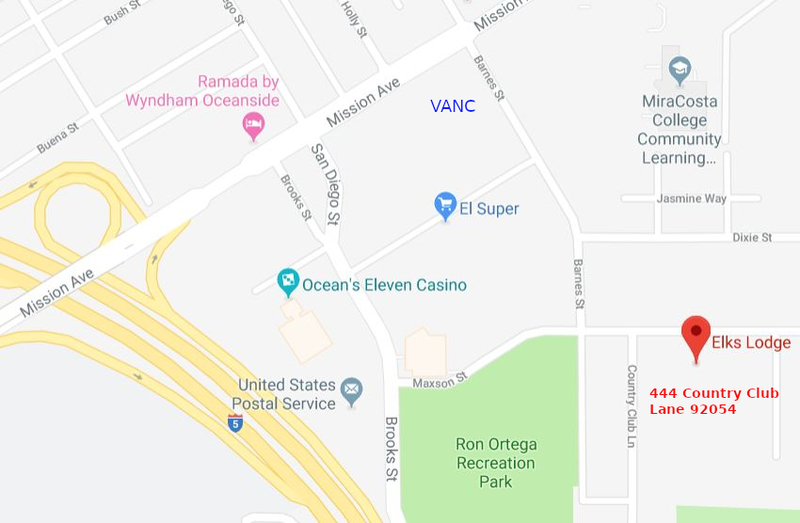 Box 1085, Oceanside, CA 92051-1085. If you do not receive your 2019 card within 7 to 10 days after renewing online, then contact the Adjutant at adjutant@legionpost146.org or 760-754-9633 for resolution. If you are interested in a Paid Up For Life (PUFL) membership, then contact me for details. The American Legion Department Service Office located in the VA Outpatient Clinic in Mission Valley at 8810 Rio San Diego Drive, Suite 1173, San Diego, CA 92108, is open to the Public on a "walk-in" basis from 7:30 to 11:30 AM, Monday through Friday. Contact phone is 619-400-5301. Free Valet Parking is available just past the main entrance. Veterans with a Medal of Honor, Legion of Valor, Former Prisoner of War, Pearl Harbor, or Purple Heart license plate may park his or her motor vehicle, weighing not more than 6,000 pounds gross weight, without charge, in a metered or hourly parking space throughout California. Note this does not apply to flat rate parking lots. For details see associated Calvet Document. Volunteers needed to transport members who can not drive to the post meetings. Contact the Adjutant at adjutant@legionpost146.org or 760-754-9633 to help. The Oceanside VA Clinic needs volunteers for the Front Desk, Coffee Services, Shuttle Drivers, Transportation Coordinator, and afternoon VAN Drivers. Please contact La Jolla VA Hospital Volunteer Services at 858-642-3267. Orientation is done completely online and La Jolla VA Hospital can get you started today. Donna Fischer is the Director of Voluntary Services. SOUND OFF! is available by email or at this website. To get your copy, ensure the Post Adjutant has your email address. He can be reached at adjutant@legionpost146.org or 760-754-9633. Note that hard copies of the newsletter are available at each post meeting, and can be mailed on request to members without computer access.